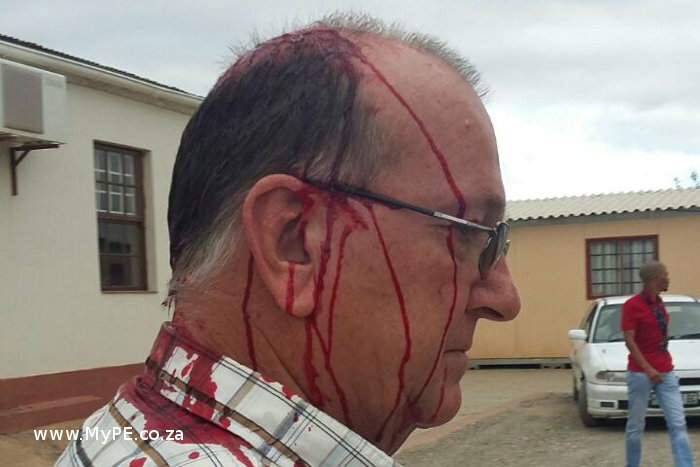 The mayor of the DA-controlled Baviaans Municipality, Ewald Loock, was struck on the head with a knobkierie in his office in Willowmore this morning by striking municipal workers. The DA strongly condemns the vicious and ugly assault on the mayor of Baviaans Municipality, Ewald Loock, who was hit over the head with a knobkierie by striking workers in Willowmore this morning. This thuggery must be stopped. The local Willowmore police have failed to act and ensure that the striking workers do not damage municipal property and assault employees in keeping with a court order. The police cannot stand idly by while violent assault and damage to property are the order of the day. My colleague, Marshall von Buchenroder MPL, has been in touch with the SAPS at provincial level and they are now going to deploy a Public Order Policing Unit (POPS) to Willlowore. This should have happened long ago. Why does it take blood to flow for the police to act? The strike is around pay parity, as a result of the Rietbron-area being added to the Baviaans Municipality. This is not an issue that the Baviaans Municipality can resolve alone. This needs the intervention of the Sarah Baartman District Municipality (SBDM) and the Department of Cooperative Governance. The SBDM cannot fold its arms and ignore its role. The DA calls on SAPS and the SBDM to fulfil their constitutional roles so that law and order can be restored. The DA-run municipality cannot simply be abandoned by the district municipality in the province.